The curators have included not only visual artists, but also NGOs, activists, film and documentary makers, architects and other non-visual artists, in a network of interdependent and cross-pollinating positions. By presenting non-traditional creatives in the museum’s galleries, the curators aim to enhance the discussion and the exchange of knowledge, responding to the diversity and possibilities of ecology. KE Chin-Yuan + "Our Island"
58th International Art Exhibition. Artist: Shu Lea Cheang. Curator: Paul B. Preciado. Commissioner: Taipei Fine Arts Museum. 10 Sept. 2016 - 5 Febr. 2017. 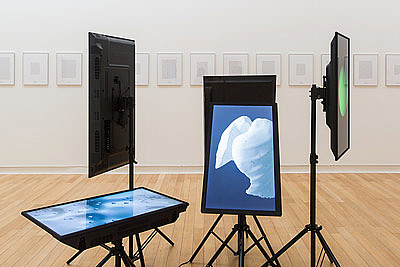 Gestures and Archives of the Present, Genealogies of the Future. Curator: Corinne Diserens.